The black base is Soulstice Spa Gotham, and I stamped on the vines from Bundle Monster plate BM-406 with Sally Hansen Insta Dri Silver Sweep. 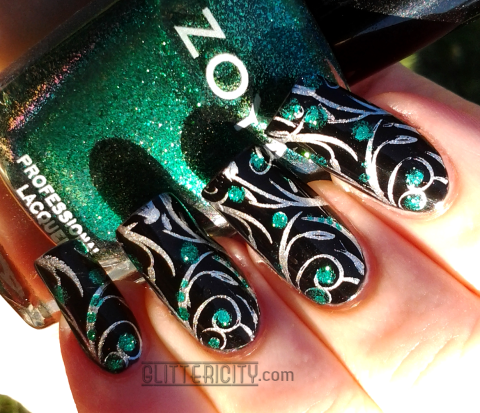 For a touch of colour, I grabbed Zoya Ivanka (pictured... only the most beautiful green polish in the universe) and a dotting tool to accent the stamped image. Finally, topcoated with KBShimmer Clearly On Top. It was a bit late in the day before I could get the sunlight pics, so the shadows are long and the sparkliness of Ivanka is not quite as noticeable. Nevertheless, I hope you enjoyed this mani--I'm really liking it and I got several compliments on it at work!